Venue: Wellbeck Colliery CC. Start: 10:30 BST. Coverage: Live commentary on the BBC Sport website and the BBC Sport App. Graham Wagg has been ruled out of Glamorgan's opening 50-over match against Nottingham Outlaws on Sunday. 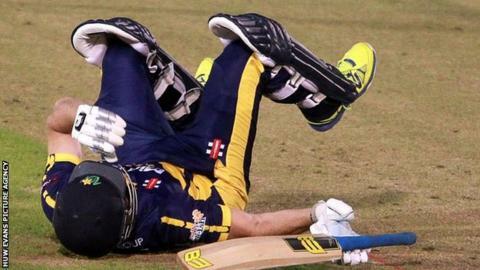 The all-rounder was struck on the head while batting in the T20 match against Gloucestershire on Friday. Glamorgan captain Jacques Rudolph says they must begin their Royal London One-Day Cup campaign strongly after missing out on the T20 quarter-finals. "You have to win your first three games to stand out depending on other results," said Rudolph. "I think we've got the players to do the job for us." Wagg opened the batting for Glamorgan in the rain-affected match against Gloucestershire, but sat out the rest of the game after he was hit by by a Craig Miles bouncer. While Glamorgan's defeat to Gloucestershire brought their T20 campaign to a miserable end, their hopes of gaining promotion from County Championship Division Two suffered a setback with successive losses to Essex and Lancashire. The Welsh county will begin their One-Day Cup campaign on minus-two points, deducted for preparing a poor pitch in last year's defeat by Durham. Durham won a low-scoring match by 52 runs, with the pitch being reported to the England and Wales Cricket Board by umpires Peter Willey and Mark Benson. The two-point penalty was suspended and applied for this year's competition. "Unfortunately we start with minus two points but we'll give it a good crack for the first four or five games and see where we're at," added Rudolph. "If we're not up there then it opens up the competition for a couple of younger players. "We've got a good group of senior players. Colin Ingram's best stats are in the one-day game, his best form is in the one-day game and he could be a real match winner for us." Young batsman Anuerin Donald is included in the squad for Sunday's match. The 18-year-old scored a double century in a second XI match this week, and has been named captain of the England under-19 team for a one-day series against Australia in August. Glamorgan squad: Rudolph, Bragg, Ingram, Cooke, Lloyd, Donald, Wallace, Maschede, Smith, Salter, Cosker, Hogan.